On November 13 a major new release of Scholar@UC became available. Scholar@UC is undergoing an upgrade! On Oct. 19 or soon after, Scholar@UC will freeze content to undergo a planned migration to an upgraded platform, “Scholar 3.0”. During the freeze, all content including works, collections, and user profiles will be available but read-only; submitting new content will not be possible during this time. The content freeze is projected to last a little over one week (restoring full access on October 30th or soon after). Once the migration is complete, an all-clear email will be sent out and new content contributions and changes can resume. The University of Cincinnati Libraries is seeking a Digital Lab Manager (a 3-year renewable position). The successful candidate will direct the operations of a digital lab in a university research library, including digitizing rare books, manuscripts and special collections, managing digitization projects and workflows, maintaining equipment and software, providing quality control, and supervising student assistants. This is an exciting opportunity to join a dynamic and diverse organization in a great university, great city, with high potential for interesting technical work. Evaluation of candidates begins on September 21, 2017. The University of Cincinnati is an EE/AA employer. For more information and application instructions see: https://jobs.uc.edu/job/Cincinnati-Digital-Lab-Manager-OH-45201/425512200/. After working through some storage limitations on the Digital Resource Commons, the UCL Digital Lab is pleased to publish several recently digitized items. In July 2016 the Eaton family donated two jewels from their family archive: the first thesis ever written at the University of Cincinnati in 1820 by John Hough James and a letter from President Thomas Jefferson, to whom James had written for additional source material on Poland. About three years ago, UC Libraries published a digitized collection of historical ledgers from the Hamilton County Morgue, documenting the circumstances of death for thousands of Cincinnatians. Somehow during this process, one of the volumes was missed. We have just published volume 11 of the Morgue Records, 1910-1911. While most issues of News Record from the 1960’s and 70’s have been digitized over the past five years, we were missing seven volumes from the 1970’s. The UCL Digital Lab is pleased to publish the complete run from the 1970’s, each issue has been OCR’ed and full-text indexed. We have recently published a digitized collection of 116 UC commencement programs, from 1878 to 1973. While most years only include the official program, some contain invitations to commencement-related events and even the text from commencement addresses. These programs have been OCR’ed and full-text indexed to make it easier to search for UC alumni. The Preservation Lab has been publishing treatment reports and photographic documentation that are a record of conservation treatments conducted in the lab on special collections items held either by the University of Cincinnati Libraries or the Public Library of Cincinnati and Hamilton County. The reports offer detailed bibliographic information and technical information on the construction of the materials. Several new reports have been added to both the UC Libraries and Public Library collections. The UCL Digital Lab has been busy over the past several months digitizing new content and collections. While we are still curating some of that content, we wanted to share a few things in the meantime. The collection of the letters of Ambrose Bierce to Myles Walsh consists of the correspondence to Elizabeth (Lily) Walsh and Myles Walsh from 1895-1911. Myles Walsh’s sister, Lily, was a protege of Bierce and during her illness–and after her death in 1895–in young adulthood, the two men began writing to each other. The Archives and Rare Books Library created an online exhibition last year. The letters have now been added to the DRC as searchable PDFs. We digitized several books and reports relating to UC. All are now available in the Digital Resource Commons. A complete list is presented below, in chronological order. I know what you’re thinking: Indian botany, where did that come from? UC Libraries has a fantastic collection, some of our items are rare and unique. Occasionally these rare and unique items are requested through Interlibrary Loan. Unfortunately, frequently, due to their rarity and condition, we are not always able to fulfill the requests. We’ve embarked upon an effort to, when possible, digitized this content and make it available to the work in digital form. The first example of this is Some Wild Flowers of Kasmir by Emilia F. Noel. UC’s copy of this 1903 botanical exploration of Kashmir includes many penciled in annotations, believed to be in Noel’s own hand. As we are able to publish more collections, we’ll make announcements here! Update to message posted earlier (9:17 am) today: Journals@UC is now available (as of approximately noon, EDT). All other library systems affected by the maintenance described in yesterday’s post were available by approximately 9 am this morning. The planned network maintenance announced for 3 am to 8:30 am this morning (June 18, 2016) is complete. All library systems mentioned in this earlier post are available, except Journals@UC. Staff are actively working to bring that system up and this blog post will be updated when this issue is resolved. Update, May 16, 2016, 4pm: The website migration has been completed. Let us know what you think about the new site! Next Monday (May 16), the Digital Collections & Repositories department will launch a new website. The website will be fully responsive and will work on all devices. Graphics will be prominently featured with less text overall. New features include a card-based collections page that can be filtered by library, subject, or format. We’re very excited to launch this new site and hope our users will find it easy to use. During the transition on Monday, May 16, you may experience difficulties using the website as we copy new files over and remove old files. 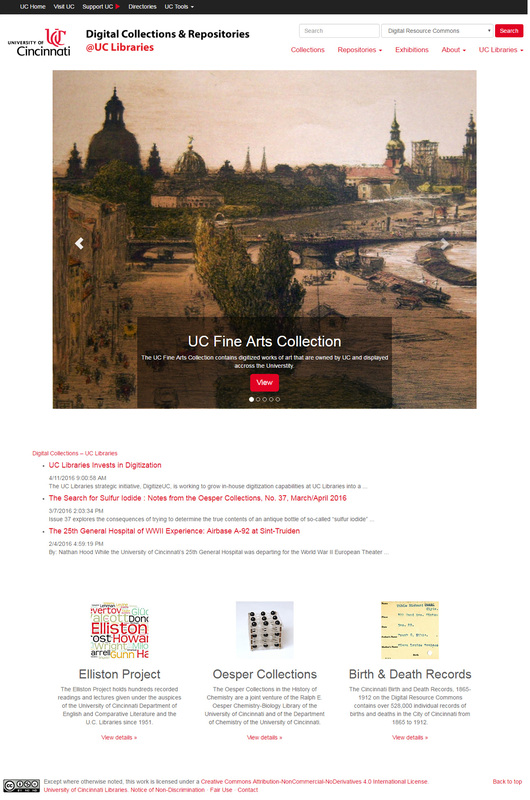 New Digital Collections & Repositories website home page.